A rich aromatic rice with spices and vegetables. Chop the beans and carrot - lengthwise. Chop the capsicum, split the green chillies lengthwise. Fry the paneer in ghee/ oil until golden brown and keep it aside. Fry few chopped onions for garnishing. In the cooker, heat oil and ghee,add all the seasoning ingredients. Add the coriander and mint leaves, saute them. Add the green chillies , fry them for a min. Add the chopped vegetables along with tomatoes and saute them well. Add the turmeric powder, chilli powder , coriander powder, garam masala powder and mix them well on medium flame until the raw flavor extracts from it. Finally add the rice with 3 cups of water and 1 cup of coconut milk along with salt. Allow it for 2 whistles. Biryani looks nice, i like biriyaniits my all time favourite one. Hey, thats looks amazing..I do prepare them often..Infact am making one today.. 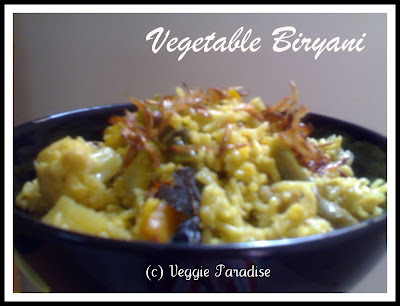 I love vegetable biryani..this looks nice and tasty..
Looks delicious..I dont add C powder ..Will try ur version tomorrow and let u know aruna..
biryani looks yummy!.... adding fried onions, paneer...wow! Biryani looks superb and tasty..
looks delicious aruna, will try your version too.. The Biryani looks so delicious!!!! Hi Aruna, First time here. Can never say to biriyani any time. Lovely !! Drop @ http://sashirecipes.com sometime when u find time. Yum..love that bowlful of Biryani..my all time favorite!! Loved ur version of biryani. An all time favourite in my family. Wonderful presentation. 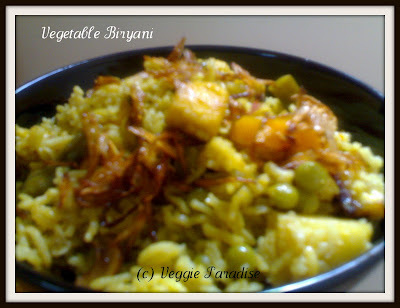 Vegetable biryani looks spicy, delicious and mouth watering. How nice we both carry the same first name. Biriyani is my fav dish, pls pass it on to me. I am FOR biryanis forever.... Be it veg or non veg..... Oh! How much I love to savor them.... I'm sure u have enjoyed every bite till the last grain...... KUDOS!!!! I love briyani with lots of soambu! Sounds great Aruna! Briyani looks so inviting and tasty! Everything looks so delicious! Biryani is mouthwatering! This biryani looks delicious. I loooovve Indian food it is so full of flavor and honestly one of my very favorite food types. I have always been intimidated by making Indian food at home but, your recipes look delicious and pretty straightforward.